Today’s topic was not what I originally planned on having up this week. 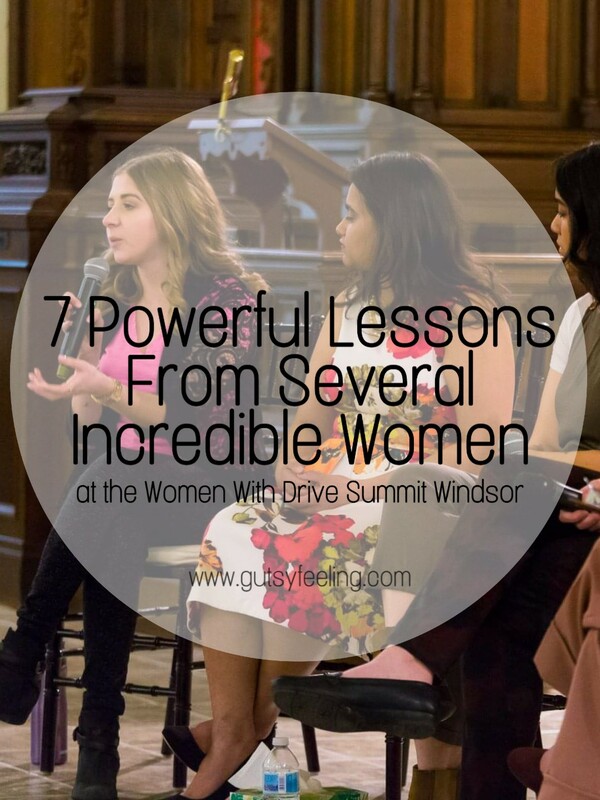 But, after attending the Women With Drive Summit last weekend, I knew that I needed to share what I learnt. This event was put on by Cierra Bray as a part of International Women’s Day in order to have women join together and learn from one another. This event had 24 amazing speakers, and I feel blessed to have been one of them. These women came from all walks of life and all had a unique perspective to share with the group. Throughout the two-day event we went over topics including meditation, yoga, journaling, self care, healing, self love, manifestation, positive psychology, eating with intention, alternative medicine, water color and much more. This event was truly AMAZING. And when I say amazing, I mean AMAZING. There was so much growth from all people at the event and so many raw and open conversations throughout the weekend. I decided that today I will be sharing my top 7 lessons that I learnt from the powerful women who spoke at this event. But, before we jump in be sure to follow my Instagram, Facebook and Pinterest to get more updates from me on my day to day life. We kicked off the event by hearing both Lisa Gretzky and Jayce Beaudin-Carver speak about their story and their lessons along the way. This was truly an inspiring talk and a great way to kick off the event. It was an excellent reminder that EVERYONE HAS A STORY, and everyones story is important and SIGNIFICANT. By listening to all the hardships, struggles, and victories that each women faced, it allowed me to truly see new perspectives. It is important to hear other peoples points of view, and I think that these speakers allowed me to do just that. On Saturday, I also had the pleasure of hearing Dr. Megan Valero speak about her naturopathic medicine practice. During her session she spoke a lot about the importance of energy and how we need to nurture and protect it. She explained a little bit about the different forms of energy based on various ancient practices. Energy, ch’i, reiki, and prana are all synonyms for one another, however, they are simply all from different schools of thought. None the less, she focused mainly on the idea of ch’i in Chinese Medicine. She explained that there are different ch’i associated with each organ. Chinese Medicine explains that ch’i moves its way through your body every single day, and so it is important to nurture our body and keep the energy path open in order to stay health. Otherwise, if the energy is blocked, sickness occurs. Certain practices can be done to help keep the energy moving. Some of which include, yoga, kick boxing, running, acupuncture, and much more. I thought that this was very interesting and an alternative way of looking at health. Whether you believe in this holistic practice or not, I think that EVERYONE can benefit from some of the practices associated with keeping ch’i moving in the body. Self care and self love is something that I am ALWAYS trying to preach on both my blog and my social platforms in anyway I can. However, I believe that it is important to continually learn new ways to take care of yourself and practice self love. The panels on Saturday focused on the idea of self love, self care, healing and taking care of yourself. These panels allowed for discussions into the importance of taking care of yourself and why many of us do not leave the time to do so. For many of us we where many hats. We are mothers, daughters, students, bosses, friends, side hustlers, and much more. But, with all of these hats, burn out can be VERY EASY. I am sure that we have all experienced burn out in our lives, but this is something we should be avoiding at all costs. The main message that I took out of these discussions is that we DESERVE TO TAKE CARE OF OURSELVES. It is not selfish and it is not optional. You have to fill your cup first before you can allow it to spill over to others. One of the powerful talks from Sunday was about the magic of manifestation and how you can go about manifesting your dreams. Christa Realba is a new friend of mine, and let me tell you, she has so much knowledge and insight when it comes to business and going after your dreams. She shared with us her 7 step recipe to manifest anything that you want. I will share with you a few of these steps here today, but if you want to get ALL the steps, make sure to check out this Facebook Live video in her Facebook Group where she explains everything in depth. Can you see what you want, can you feel what you want? Get specific about the details. For example, if you want to go on vacation. Where is it? When is it? How will you feel when you are there? In order to manifest your dream you have to put it out there. You have to believe in this dream, and you have to believe and act as if it is already yours. We can’t control all aspects of how this dream will come to flourish and so we have to trust in God/Universe that everything is working out as it should. We can become obsessed with the final goal, but we have to be flexible on HOW we get there. Gratitude is so important throughout the whole process of manifesting your dreams. We must celebrate every little win! In order to manifest your dream all the way through, you have to keep your vibes and energy HIGH. You must CHOSE how you want to feel and you must make a conscious effort to keep your mood up! Do you want to know the last steps right??? Head over to Christa’s page to find out. Following Christa, we had the amazing Dr. Andrea Dinardo. She explained to us all about positive psychology while sharing with us some of the struggles she faced earlier in her career as a psychologist. The main focus of her discussion was about protecting yourself from everyone’s problems. One of the main things that she greatly struggled with years ago was protecting her own mental health when she had all of these patients who needed her help. She explained to us that we should be focusing less on the PROBLEMS in our lives, and more on strengths and goodness in our lives. When someone comes to her with a problem, she believes it is best to speak 15 minutes about the problem, and 45 about the solutions, strengths and goodness. Dr. Dinardo explains that we must build on what is STRONG, not on what is WRONG. If you spend too much time talking about the problems, you will never find a solution. She also explains that we must protect ourselves from other peoples problems. We should be respectful of other peoples time and energy, and ensure that it is okay to talk about our problems with other people. We often word vomit our problems onto so many people in our lives and this is not okay to do all the time. She explains one of her favorite practices is the 10 minute timer. She allows her friends to vent for 10 minutes, and after that time it is over. Overall, it is important that we protect our energy and respect others energy in order to stay sane and happy. On Sunday, we had the pleasure of hearing from Neviana Maleyko on the power of eating with intention. Her story really hit home with me because she suffered with Colitis for 10 years before she was in remission. She was able to achieve remission by having a huge mind shift in her life 3 years ago. She shifted her mindset towards food and her intentions behind food. While doing so, she also started working on releasing some emotional baggage that she had in her life. Her story is truly incredible and it allowed me to look at life and our priorities in a new way. Some of the main lessons that I took from her talk were surrounding the process of digestion and eating with intention. She explained to us all that HOW you eat is just as important as WHAT you eat. – Minimize Distractions While Eating: This means no phones or TV. – Listen to Your Body: We have a choice in what we eat and so we should try to always pick local, organic, and better food. While doing so, we should also think of our mood and what our body needs and craves at the moment. – Slowing Down: We should be chewing our food 30-70 times per bite. We should be mindful while eating and really enjoy and savor every bite. – Food Preparation: We should focus on the preparation of the food and the energy that goes into this. Making most if not all your food from scratch is ideal. This lesson comes from my new friend Cierra Bray. She worked SO HARD to make this event a reality and without her I wouldn’t be sitting here writing this post and feeling so inspired by all the lessons I learnt. Cierra faced a lot of barriers when making this event, but guess what? She did not let them stop her. She jumped all of the hurdles, worked through criticism and she achieved her goal. This inspired me, and reminded me that we are all capable of amazing things. So, if you have a passion project or something that you have been putting off, use Cierra as inspiration. YOU CAN DO IT. Put your head into it and I know you will achieve your goal. Now the event is over, but Cierra isn’t done yet. She has decided to make a Facebook group where we can connect with the women we met at the summit in the future. She has also decided to send us weekly emails and set us weekly challenges to keep us inspired! If you want to take part, make sure you check it out and connect with other like minded women. If you liked the post make sure to share it with a friend and subscribed to my blog to get email updates every time I post. Also be sure to follow me on Instagram, Facebook and Pinterest to get more updates from me on my day to day life.